While the British forces were attempting to turn the Northern flank of the new Hindenburg line, near Arras and Vimy Ridge, the French Armies were assaulting the Southern pivot of the Hindenburg line between Soissons and Rheims. The chief objective of the French was the Craonne Plateau, a ridge twelve miles long and rising some 200 feet above the level of the plain. The slopes of the Plateau, on the side facing the French position, were ringed clear to the summit with a series of German trenches, all bristling with machine guns and occupied by 500,000 soldiers commanded by the Crown Prince Frederick. Its rocky crest was cut with deep ravines and caverns, affording admirable cover for many machine gun nests. From end to end, along its wide summit, runs the famous Chemin-des-Dames ("Ladies' Road"), a shaded boulevard constructed by orders of King Louis XIV for the pleasure of his daughters. On the reverse slopes of the plateau, the German artillery was well concealed. Excepting Vimy Ridge, there was no other position on the Western front so formidable as this. To attempt its capture by direct assault seemed a desperate enterprise. There was, however, a more vulnerable point of attack just south of the Craonne Plateau, where the Hindenburg line traversed a stretch of flat country, covering a gap some ten miles wide. If this gap could be penetrated, the German line would be broken in halves and the way opened to assault the German strongholds from the rear. The Germans had expended much labor in strengthening this gap. Elaborate concrete works had been constructed and the hill near Ville-aux-Bois tunneled to provide a series of galleries in which the German troops might find protection from artillery fire. East of Rheims, and dominating the whole of Champagne, rose the isolate Moron Villers Hills, constituting a military obstacle hardly inferior to the Craonne Plateau itself. General Nivelle had planned a threefold attack on the Southern flank of the Hindenburg line. The Army group commanded by General d'Esperey was ordered to advance across the Western face of the Soissons salient at St. Quentin, above Craonne Plateau, and break through to Laon. The Army group under command of General Micheler was to push northward, between Soissons and Rheims, straight over the great Craonne Plateau, uniting with d'Esperey's army at Laon. If this double movement succeeded, the German Armies defending Craonne would be caught in a gigantic trap and either captured or destroyed. 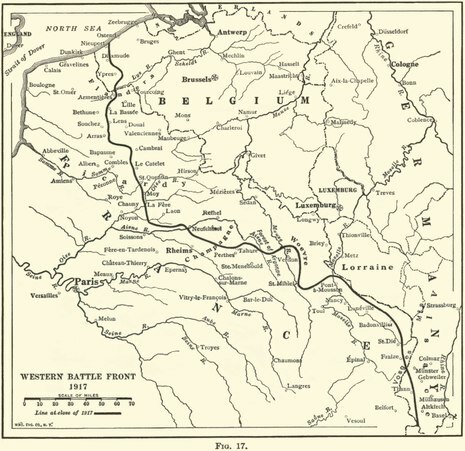 Further south, General Petain was to launch an attack against the Moronvillers Hills, east of Rheims, to prevent the sending of German reinforcements from that sector to Craonne Plateau. The opposing infantry forces were about equal, 1,500,000 each, but the French still were weak in cannon, munitions and armament of all sorts. On the eve of the French offensive, mutiny broke out afresh among the officers of the various armies. 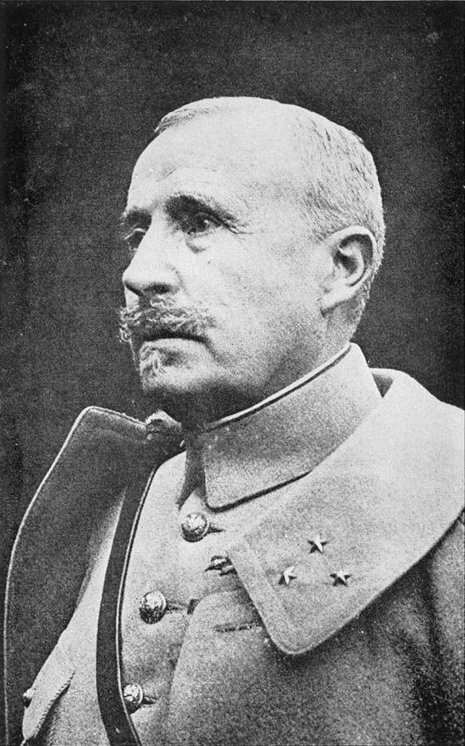 Foreseeing a dreadful slaughter if General Nivelle's plans were carried out, the French generals with but few exceptions pleaded with him to abandon the hopeless enterprise and adopt the safer plan proposed by Marshal Joffre. But to all their pleading General Nivelle turned a deaf ear. The disaffection among the officers had its immediate political effect. The Briand Ministry, which had elevated Nivelle to the supreme command, was forced to resign and a new Cabinet formed with M. Ribot as Premier and Painleve as Minister of War. Painleve endeavored to restore order out of the chaos which reigned in the French Army, by cautioning Nivelle to go slow in his offensive, but his advice went unheeded. The inclement weather conditions further assisted in weakening the morale of the French Army. Under the perpetual pelting of the sleet, which fell daily, three quarters of the unacclimated troops collapsed. Due to the same causes, which prevented aerial observations, the French gun fire was inaccurate. Ten days of artillery preparation failed to reduce the enemy works over the wide front. The battle of Craonne opened April 14, 1917 with a violent attack on St. Quentin by the group of armies directed by General d'Esperey. If the German line could be pierced at this point and the French push through to Laon, the whole German defense might soon be crumpled up. 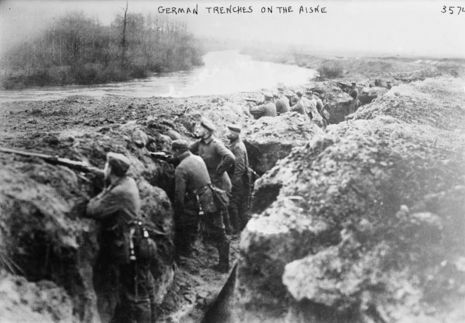 The Germans, realizing the danger, concentrated in great force on this sector. Having the superiority in artillery they were enabled to beat down the French attack within 48 hours. D'Esperey was unable to resume his offensive; he had completely failed. Undeterred by this ominous defeat of St. Quentin, General Nivelle on April 16, 1917, decided to launch his desperate attack on the formidable Craonne Plateau, at the very moment when the British advance east of Vimy Ridge was being brought to a halt. Following an artillery preparation, which destroyed the enemy's first line, three French Armies commanded by General Mangin, General Mazel and General Duchesne left their trenches and advanced rapidly towards the gap between Craonne and Fort Brimont. Forewarned by a detailed plan of battle, given by a French officer to a mere private who had been captured the day before, the Germans had withdrawn most of their forces from their front line trenches to the stronger trenches in the rear, which were packed with machine guns. 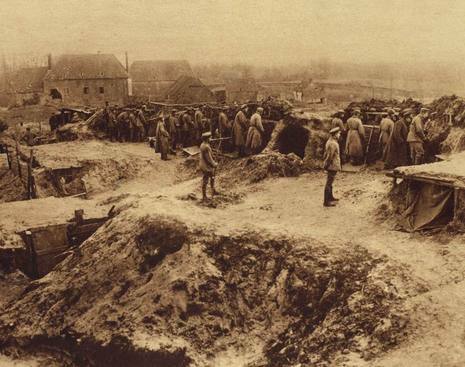 Sweeping forward in successive waves, the French overran the German front trenches, overrunning the Chemin-des-Dames, taking 2,500 prisoners and capturing the town of Loivre after overcoming stiff resistance. French tanks, used for the first time in this battle, attempted to open the way for the cavalry exploitation to Laon behind the Craonne Plateau, but they were halted at Pontavert and failed to reach their objective, the third German line. The French Infantry, advancing up the slopes of the Plateau toward the second line of German trenches, encountered a hurricane of bullets from thousands of German machine guns which stopped them dead in their tracks. The resistance was especially effective south and east of Brimont Ridge, from which position the Germans for two years or more had been bombarding Rheims. In the afternoon the Germans violently counter attacked all along their line, definitely halting the French advance before the second line. 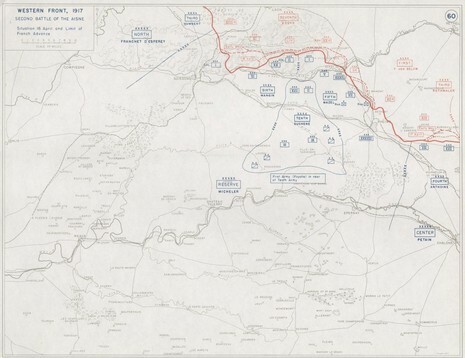 So, instead of reaching Laon in a single day, as General Nivelle had so confidently predicted, the French had progressed only a few hundred yards in this sector. General Nivelle, on Apil 17, 1917, directed Generals Mangin and Mazel to shift their attack to the northeast and at the same time General Anthoine's 4th Army was launched against Moronvillers. For three days the battle waged furiously, all the way from Soissons into Champagne. Despite the rain and the snow, the attack of the French proved irresistible. South of Moronvillers, the German first-line positions over a front of ten miles were taken and to the east a strongly organized line on a front of eight miles was captured. On this sector more than 3,000 Germans were made prisoners. Midway between Soissons and Rheims, 17,000 prisoners and 75 cannon fell to the French and a counter-attack launched by the Germans north of Rheims was broken by a force of Russians guarding this part of the line. So accurate and deadly was the French gunfire that German prisoners reported an average of only 80 survivors out of companies numbering 250 men. On April 18, 1917, in the forest of Ville-aux- Bois, where an enveloping movement was carried out, 1,300 Germans threw down their arms and surrendered. Between Soissons and Rheims, the villages of Ostel and Broyeen-Laonnois were captured, together with much war material and 19 cannon. At the close of the third day of battle the German line, from Soissons to Auberive, was driven across the Aisne, the last German hold on the south bank of the river east of Soissons falling into the hands of the French on April 18, 1917. The French scored further gains on both wings of their 50-mile front on April 19th. On the right, after storming a powerful position north of Auberive, they pushed up to the outskirts of Vaudesincourt. Eighteen fresh German divisions were then thrown into the fight, but they were unable to stop the French who in the night stormed Mount Haut and other strong points about the Moronvillers Ridge and beating back many furious counter-attacks. Since the beginning of the offensive the French had taken 19,000 prisoners and 120 guns. On A considerable portion of the front, from Soissons to Craonne, the Germans were retiring to their new line, their old defenses being destroyed by the concentrated French artillery fire. Gradually all the German salients along the Soissons-Auberive front, were being crushed. The principal salient to which the Germans had clung formed an angle east of Rheims. Caught as in a vice by the troops advancing northeast from Laffaux and northwest from Vailly, the angle collapsed when the French captured Fort Conde. The primary object of Allied strategy was not to pierce the German lines, but to break the resistance and reduce the physical and moral strength of the Germans everywhere. In ten days the Germans had lost 35,000 prisoners and 300 guns, and inflicted losses in killed, wounded and missing estimated at 100,000. The French losses, on the other hand, had been equally great—15,500 killed, 70,000 injured, 20,000 missing, a total of 100,000 casualties. All that General Nivelle had to show for that loss was a section of the Chemin-des-Dames, the reduction of the Vailly salient, the elimination both of the German bridgehead south of the Aisne and the German position near Fort Conde. General Micheler, on April 21, 1917, had informed General Nivelle that it was time to abandon the campaign, since there were only four divisions of infantry available in the French Reserves to carry on. The assault on Craonne Plateau had failed and the German line had neither been flanked nor ruptured. The morale of the French Army was now so shaken, that veteran regiments, which had participated in scores of victorious battles, declined to advance and many death warrants were signed of French soldiers who refused to obey the orders of their commander in the face of certain death. Alarmed at the disaffection in the Army, and appalled at the size of the French losses, the French Government on May 15, 1917 removed Nivelle and intrusted the supreme command of the French Armies to General Petain, the hero of Verdun. His first act was to call General Foch from undeserved obscurity and appoint him Chief of Staff, while General Fayolle was given the command of Petain's group of armies. General Petain at once notified General Haig that months might elapse before the French Armies would be in condition to resume the offensive. As a matter of fact, it was late in October when Petain was ready to launch his offensive, not at Craonne Plateau, but on his old stamping ground at Verdun. After his demotion, General Nivelle went into retirement. La Chanson de Craonne (English: The Song of Craonne) is an anti-military song of World War I written in 1917. The song was written to the tune of Bonsoir M'Amour (Charles Sablon), sung by Emma Liebel. This song was sung by the French soldiers who mutinied (in more than sixteen of the one hundred divisions of the French Army) after the costly and militarily disastrous offensive of General Nivelle at the Chemin des Dames. The song was prohibited in France until 1974. Even though an award of 1 million francs and the immediate honorable release from the army were offered for revealing the maker, the original author of the song remained unknown. The brought about severe reprimands, notably by General Pétain, who was named on the 17th of May as the replacement for General Nivelle. He was directly tasked with the mission of rebuilding the sagging morale of the war-weary French Army. He went about this with the punishment of the leaders of the mutiny, condemning 500 to death (though only 26 were actually executed). This song was anonymously created, though surely by many authors. The song constantly evolved during the course of the war due to the changing role of those engaged in combat. The song first appeared under the name La Chanson de Lorette evoking the the Battle of Lorette à Ablain-St. Nazaire that occurred between the twelve months of October 1914 and October 1915. The song was modified in order to sing about the battles raging across the plateau of Champagne. In 1916, the song was sung during the ghastly Battle of Verdun, with the refrain: Adieu la vie, adieu l'amour, Adieu toutes les femmes C'est pas fini, c'est pour toujours De cette guerre infâme C'est à Verdun, au fort de Vaux Qu'on a risqué sa peau La Chanson de Craonne The final version, "The Song of Craonne" was written in 1917 during the French Army's Mutinies. The village of Craonne on the plateau of Californie was the site of bloody fighting on the 16th of April 1917 during Nivelle's failed Offensives. It was these bloody offensives that pushed the French Army over the edge. We're going to go back to the trenches, Our place there is so useful That without us we'd take a thrashing. But it's all over now, we've had it up to here, Nobody wants to march anymore. And with hearts downcast, like when you're sobbing, We're saying good-bye to the civilians, Even if we don't get drums, even if we don't get trumpets We're leaving for up there with lowered head. Those who have the dough, they'll be coming back, 'Cause it's for them that we're dying. But it's all over now, 'cause all of the grunts, Are going to go on strike. It'll be your turn, all you rich and powerful gentlemen, To go up onto the plateau. And if you want to make war, Then pay for it with your own skins. 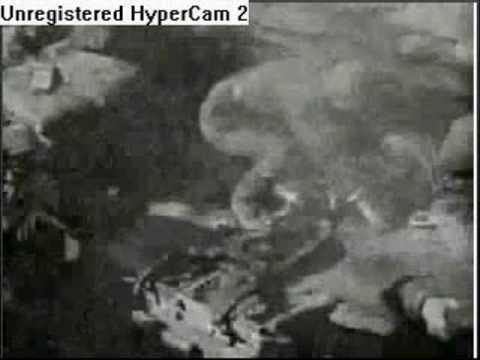 After the war this song was not allowed at all on French airwaves. The writer Paul Vaillant-Couturier, who was also a World War I veteran, preserved the song, and later had them published.